Starco Chemical can help you effectively maintain the look of a beautiful floor with all of our low cost, high quality products. Our products restore any floor type including VCT, wood, concrete, and marble. 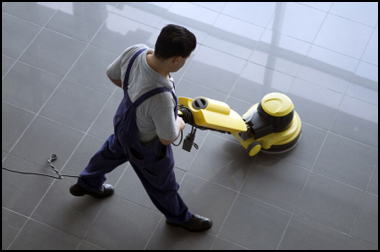 NO BUFF floor maintenance program produces a high gloss appearance without the use of a buffing machine. This convenient program is used in those facilities where either time or a lack of rotary floor equipment precludes using a more advanced floor maintenance program. 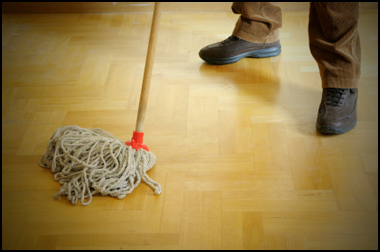 SPRAY BUFF floor maintenance program cleans, removes scuff and heel marks, and maximizes gloss. HIGH SPEED BURNISH program utilizes burnishers of up to 1500 RPM’s, to remove marks and to restore the “wet look” appearance. ULTRA HIGH SPEED BURNISH program requires the use of burnishers of more than 1500 RPM’s. This method will produce the deepest, most repairable and durable “wet look” gloss. To find out more about our floor care products and programs, contact us or call 1-800-OK4-SOAP.